After conducting Ramot Junction drive-by, two terrorists unintentionally shoot Arab victim before being neutralized. 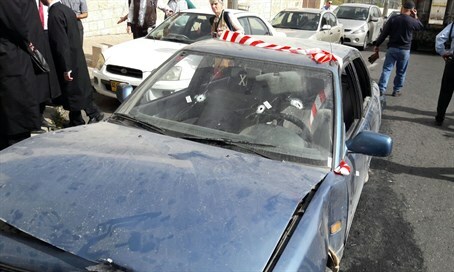 An Arab resident of eastern Jerusalem was seriously wounded in a shooting attack that took place in Jerusalem on Wednesday morning, just a short time after a shooting attack near the northern Ramot neighborhood of the capital. Police are saying the two attacks are connected, revealing that the same terrorists committed both attacks. In the second attack, which occurred on Hatzanchanim Street which runs parallel to the Old City on its northern edge at a site near the Damascus Gate, the two Arab terrorists began opening fire on passing cars near the Damascus Gate light rail station. Ironically the victim of their attack was an Arab man, and not a Jew. The terrorists were neutralized and wounded by security forces. The victim, aged around 50, was shot and seriously wounded in the attack, with Magen David Adom (MDA) medics providing him treatment for wounds to the upper body before evacuating him to Hadassah Mount Scopus Hospital. The police officer who eliminated the terrorists later reenacted the incident, saying, "I saw them, they tried to aim their weapons at me and shoot me. I took out a handgun and shot them from five meters away as they tried to escape." One of the terrorists was later pronounced dead at the hospital's emergency room. In the first attack of the morning, an Egged bus at Ramot Junction came under fire in a drive-by shooting, before an armed civilian shot at the terrorists and caused them to flee the scene in their car. During searches for the terrorists their car was identified near the Damascus Gate, at which point they launched their second attack.